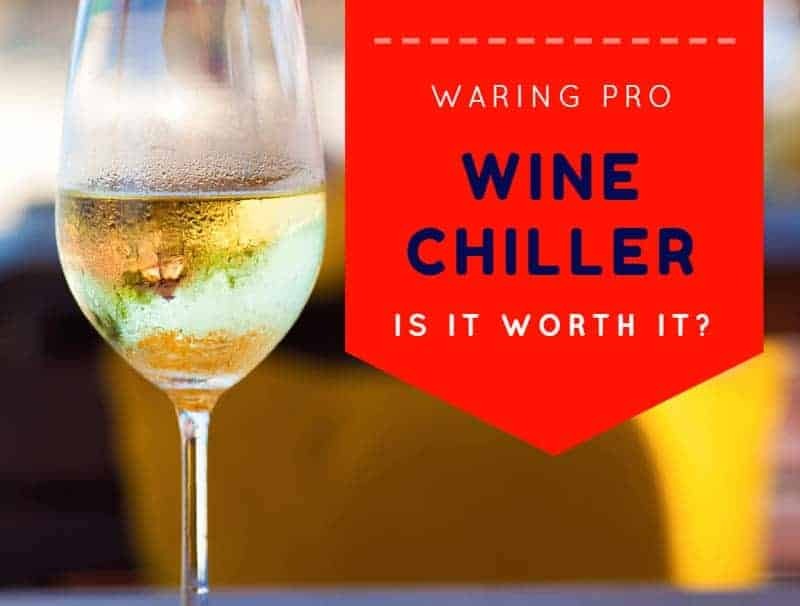 >> Waring Pro Wine Chiller: Is It Worth It? Waring Pro Wine Chiller is one of those high-tech wine accessories that promises a better drinking experience. But is it that awesome? In my opinion, yes. Read on to find out why, or click on the links in the table below to check out the features of the Waring Pro Wine Chillers. When I first heard about the Waring Pro Wine Chiller I knew I had to try it. Manufactured by one of the leading brands in the field of professional-quality home appliances, this wine accessory was very inspiring. But after a quick search, I found out that Waring didn’t have a wine chiller but a whole range of wine chillers. With over 75 years of manufacturing expertise and dozens of awesome appliances at its back, was Waring able to manufacture an outstanding wine chiller? And if so, which one was the best? I had no choice but ask a few good friends and wine lovers to pick one and test it. Here’s what we found out. Waring manufactures a small range of professional wine chillers for home use. The models have similar features and performances, while the main difference is the capacity. Probably the most popular Waring Pro wine chiller is the PC100, a simple and convenient appliance able to chill a wine from room temperature to serving temperature, or warm it up if it was stored in the fridge. The PC100’s sibling has a capacity of two bottles and is more appropriate for those accustomed to hosting large wine parties. The range also includes a high-tech digital wine chiller and a fancy model similar to an upgraded wine bucket. Ideal for those who want to brag about a technological addition to their wine accessories, these wine chillers boast impressive features. Almost all Waring Pro wine chillers have similar features. The main differences are the capacity and the overall design, two characteristics that can make a clear distinction between a yay and a nay. As a wine lover and expert, I have tested several wine chillers, including the Waring Pro. And the wine library is a feature that wowed me. Because unless you’re a true connoisseur, figuring out which is the right serving temperature for each wine varietal is nearly impossible. But Waring found a simple way to help enthusiasts enjoy all flavors and aromas of their favorite wine. Its wine chillers come with a preset wine library containing 33 wine varietals. To chill your wine to perfection, just choose your varietal and the appliance will do the rest. Useless to say, this feature is beyond awesome. Most wine chillers on the market are able to chill wine effectively. But only a few are able to keep it at serving temperature once chilled. With Waring Pro, that’s not an issue anymore. These wine chillers are equipped with temperature control sensors designed to keep the wine at a preset temperature until you turn the appliance off. Why in the world would you need a warm function in a wine chiller, you might be wondering. Simple. Because wine lovers often keep their wines in the fridge. With few exceptions, a refrigerated wine is too cold to drink, as you’ll not be able to enjoy its full flavors and aromas. That’s why you’ll have to warm it up. To warm it up, you can keep the bottle at room temperature for a few hours. 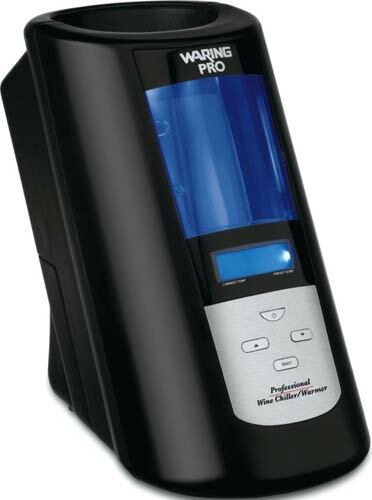 Or use the Waring Pro’s warm function and speed up the process. The warm function is also useful for many other applications. For example, you can warm up baby bottles or other hot drinks. This is where Waring could improve its wine chillers. There are many other appliances on the market able to chill a bottle in less than 15 minutes. Yet, Waring Pro needs at least 15 minutes to chill a bottle of red wine. When it comes to whites, it might take up to half an hour to have a ready-to-serve beverage. If you want to open a bottle for dinner or for a planned occasion, this is hardly an issue. Yet, you might hate waiting in those moments when you want wine “right now”! Despite the minor drawback, Waring Pro wine chillers boast simple and intuitive controls. The manufacturer kept the control panels to a minimum and they are easy to use by people of all ages. Thanks to this feature, a Waring Pro wine chiller is not only great to have but it also makes a great gift for a wine lover less experienced in handling appliances. How to choose the right wine chiller from a collection of very similar appliances? Consider the differences and see which one truly fits your needs. Like mentioned above, a difference between the various Waring Pro wine chillers is the capacity. If you only drink wine occasionally, a one-bottle wine chiller might be enough for you. However, if you love throwing wine parties, pick a chiller with a capacity of at least two bottles. A double wine chiller might also be great if you like to drink different wines concurrently. For instance, if your main pairs with a red and your dessert with a sparkling, you can chill both wines at the same time with a double wine chiller. From traditional to high-tech, Waring Pro manufactures wine chillers for all tastes. My favorite is the newest Digital Wine Chiller PC1000. Boasting a sleek and stylish design, it fits wonderfully in my kitchen. But you can choose any model you like. Ultimately, consider your budget. All Waring Pro wine chillers have similar features and you’ll be able to enjoy a perfectly chilled wine regardless of your choice. Like it’s easy to imagine, the basic models are less expensive yet you’ll have to compromise on looks or capacity. Waring Pro Wine Chiller PC100 is probably the most popular wine chiller manufactured by the brand. It has a capacity of one bottle and boasts a professional, elegant design that fits well in most kitchens or interiors. The wine chiller is suitable for both home use and commercial environments. 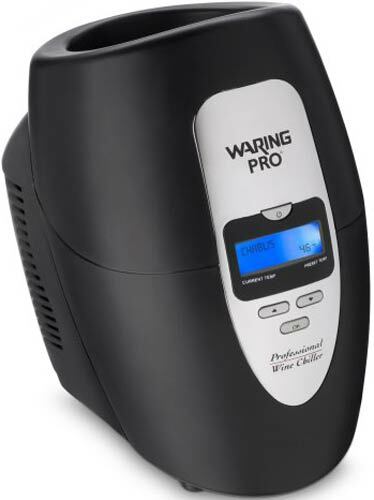 The PC100 is designed to accommodate standard 750ml bottles and comes with the Waring Pro’s preprogrammed temperatures for 33 varieties of wine. This feature makes it ideal for the average wine lovers. The unit is equipped with a thermo-electric Peltier module designed to keep the temperature constant once the chilling temperature is reached. This allows you to fully enjoy the wine throughout the dinner or have it ready to drink whenever you want. An intuitive control panel makes the PC100 easy to operate. The wine chiller has an LCD backlit screen that allows you to check the selected temperature and set the unit. Temperature control: once the bottle reaches the desired temperature, the unit is designed to maintain it for as long as you like. Preprogrammed settings: the unit boasts preprogrammed settings for 33 wine varieties. Just select the type of wine you want to drink and the appliance will chill it to perfection. LCD screen: apart from intuitive controls, the unit is equipped with a convenient LCD screen that allows you to check the status of the wine. Warmer: the PC100 is more than a wine chiller. It can even warm a wine to serving temperature if it is too cold. The unit chills the wine very slowly. Waring Pro RPC175WS Brushed Stainless Steel Wine Chiller keeps many of the PC100’s features but boasts a sleeker design and a more elegant finish. This stylish wine accessory blends perfectly with any interior design and will let you chill or warm your wine whenever you want. The wine chiller also boasts the wine library. Its internal database includes a vast selection of reds, whites and sparkling wines. Selecting a preset temperature or customizing it to your liking is easy thanks to the intuitive control panel with LCD display. The unit has a one-bottle capacity and it accommodates wine bottles up to 3.5 inches in diameter. This includes almost all types of bottles, including some champagne and prosecco types. Another thing that impresses is the lighted viewing window that offers a beautiful glimpse of the bottle in the chiller. Presenting the wine to your guests is easy and stylish. Design: RPC175WS boasts a sleek design and an elegant brushed stainless steel finish. It makes a great addition to any interior design. Warranty: the wine chiller comes with a limited 5-year warranty for the motor. Window: the lighted viewing window enhances the design of this wine chiller, making it attractive and stylish. Control: the unit boasts a CPU control for constant temperature and is able to keep the wine at the set temperature indefinitely. The unit is noisier than one might think. 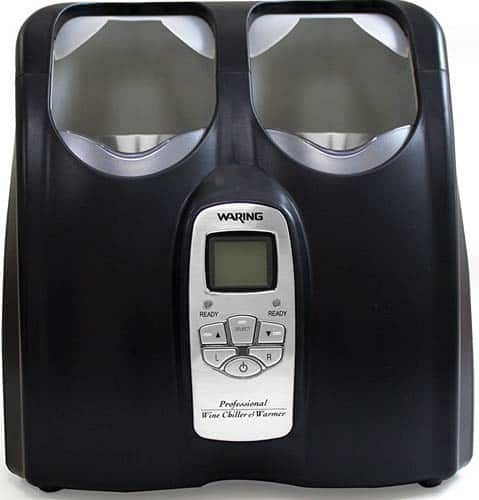 Modern and stylish, Waring Digital Wine Chiller/Warmer is designed to chill wine faster than the other Waring Pro wine chillers. And it does its job to perfection. While keeping most of the previous features, this unit has a more powerful motor that chills the wines in less time. The unit boasts the wine library the manufacturer is famous for and it is easy to control from a digital touchscreen. It is also possible to customize the temperature based on your needs or to set the unit to warm up the beverage. The chiller has a capacity of one bottle and it accommodates standard bottles. Moreover, it can also be used to chill other beverages, as long as they fit in the unit. Another thing we like is the lighted viewing window that allows you to admire or display a valuable bottle while it’s chilled to perfection. Digital: this modern unit comes with an easy-to-control digital touchscreen. Setting the temperature and switching between functions is simple and intuitive. Chilling time: the Digital Wine Chiller is designed to chill down or warm up the wine in less time compared to the other appliances from the same manufacturer. Design: this wine chiller is elegant and stylish. It fits well in all decors and is ideal to use in your wine business or at home. Warranty: this unit boasts a limited 5-year motor warranty and it will probably work flawlessly much more than that. Although faster than its counterparts, it still takes a lot of time to chill the wine. Waring Pro PC200 Double Wine Chiller is the PC100 with a double capacity. The functions and features of the two appliances are identical, yet this one is suitable for those who want to chill or warm two bottles at a time. The PC200 boasts two bottle slots and two intuitive control panels. Each panel controls its side of the appliance, therefore you’ll be able to chill two wines at different temperatures. This is great when you want to serve both a red and a white at your meal, or when throwing a wine party. Ideal for wine shops and tasting rooms too, this wine chiller is easy to use. If you’re not a true expert, the wine library will help you set the right temperature by simply selecting the type of wine you want to chill. Other than this, the temperature is also easy to set and control independently. In terms of performance, the chiller is similar to the PC100. It takes time to get the beverage to the desired temperature, but the appliance works great as long as you’re familiar with the waiting times. Capacity: there are many occasions when you have to chill more than one bottle. This chiller has a two-bottles capacity and is great for most wine lovers. Dual zone: this 2-bottle wine chiller has dual zone controls that allow you to set a different temperature for each bottle. Controls: setting the temperature or selecting the wine from the library is really easy, thanks to the intuitive controls. Screen: the LCD screen will help you monitor the temperature and status of each wine chamber, for added convenience. The wine chiller is really noisy. Boasting a stylish design and matching the interiors of all wine lovers, Waring PC500PC Wine Chiller is nothing but a fancy wine bucket that comes with all the advantages of a professional-quality kitchen appliance. This wine chiller has two wine holders shaped like a traditional sommelier bucket and is designed to chill wines in minutes. You can even add ice to the chiller to speed up the process, while the revolving holder accommodates bottles up to 4 inches in diameter. The unit also brings the cordless convenience. Want to chill your wine outdoors? No worries. This wine chiller comes with a rechargeable battery pack and it can chill your beverages anywhere you want. When running out of battery, just plug the unit into an outlet to keep it working. The chiller is easy to control from an intuitive digital panel. You can set the desired temperature and monitor your beverage’s chilling status on an LCD display. Style: this Waring Pro wine chiller looks like a traditional sommelier bucket and is designed to chill wines in minutes. Wine holders: the two wine holders can accommodate bottles with diameters up to 4 inches. This includes most champagne bottles. Cordless: the chiller comes with a convenient rechargeable battery kit. Use the unit wherever you want or switch to a power cord for limitless power. Revolving design: the wine holder revolves to chill the wines faster, and the unit can cool down a warm wine in minutes. This wine chiller doesn’t have preprogrammed temperatures. So, is a Waring Pro wine chiller worth it? It depends. If you know exactly what are its capabilities and limits, certainly! A Waring Pro wine chiller is an awesome appliance able to chill or warm wines and keep them at serving temperature for as long as you want. Will you have to wait for it to chill? Yes! But it’s certainly better than a wine bucket. If you’re wondering which is out favorite Waring Pro wine chiller, the winner is PC100. Not so stylish as some of its counterparts, this wine chiller has a great retail price and all the features the manufacturer is famous for. It comes with 33 preprogrammed temperatures and it is easy to set and control. In our opinion, the best Waring Pro wine chiller you can find when comparing the quality and price.